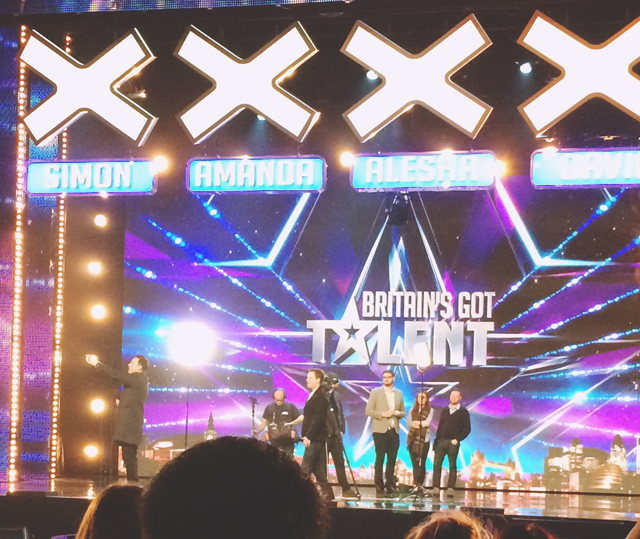 Remember last weekend when Vix and I tried- and failed- to see the Britain's Got Talent auditions? Good news- I eventually got to see them! When we were told on Saturday that the tickets had all been distributed, we were given a code to get guaranteed tickets to an audition later in the week. Unfortunately Vix couldn't make the second date so I dragged Rich along instead and we made a right day of it. Even though our tickets were supposed to be guaranteed, I was wary of how true that was so we turned up at the Dominion Theatre about 5 hours early. Thankfully, ticketing works differently on Britain's Got Talent to other filmings I've seen. Rather than the crew just letting in the first 2000 people in the line, you turn up and exchange your e-ticket for a proper theatre ticket with a seat number. Once you have this seat number, you're free to explore the city and return later, which is a much more convenient way of handling show audiences. After collecting our tickets, we popped over to Benefit Carnaby Street to get my brows done. 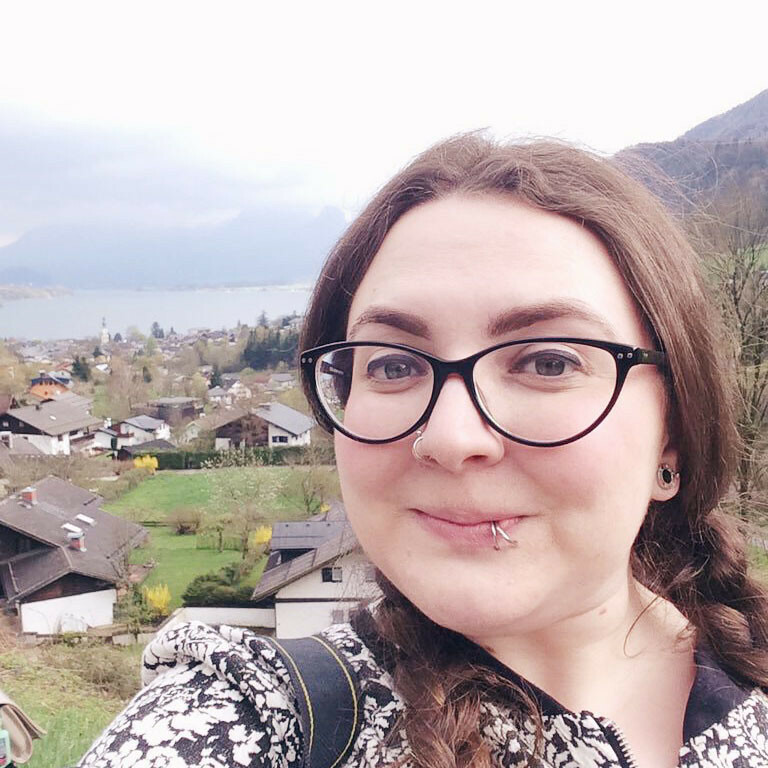 I'm gutted that my favourite brow girl has left but Sarah did mine this time and she was incredible. As it was quiet, being 10:30 on a Wednesday morning, she really took her time with them getting them just right and making sure I was happy every step of the way. It was a rainy day so my beloved Kadee Crocs (don't judge), which I've worn so much that the rubber sole has completely flattened and smoothed into some sort of rubbery ice skate, were slipping all over the pavement. Wary of injuring my foot again, we decided to head over to the Crocs store at Seven Dials and buy a new pair. I like Crocs, ok? Don't judge me! To my delight, I found a lovely, practical pair in the sale for £10 so snapped them right up. It wasn't until I put them on that I realised how much I'd compacted down the cushioning in my old pair. Let me tell you, nothing feels more amazing than slipping your feet in a brand new pair of Crocs. Oh, the cushiony goodness! 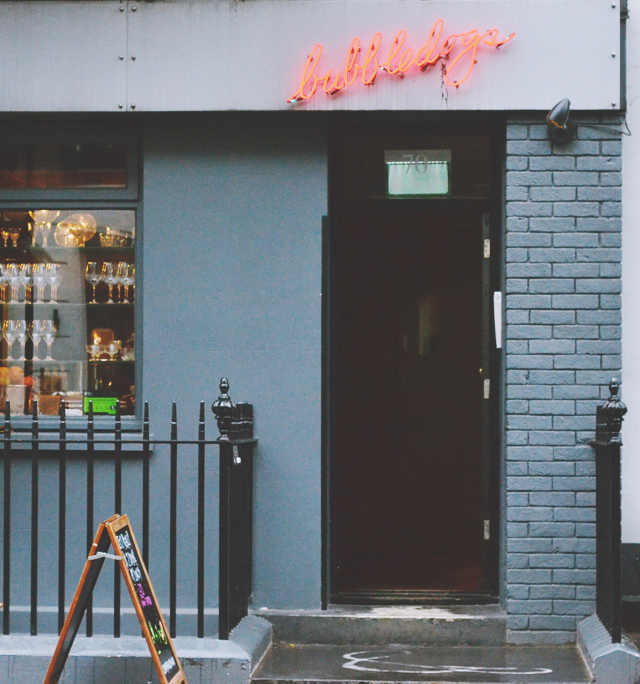 Getting a bit peckish, we completed the giant circle that we'd walked and strolled up to Bubbledogs- a champagne and hot dog bar. Yeah. It's a tiny little bar a short walk from Oxford Street with this rustic-industrial feel going on- all exposed brickwork and copper pipes. Unfortunately it's not exactly comfortable. The chairs are all those high plastic stools you find in secondary school science classrooms. 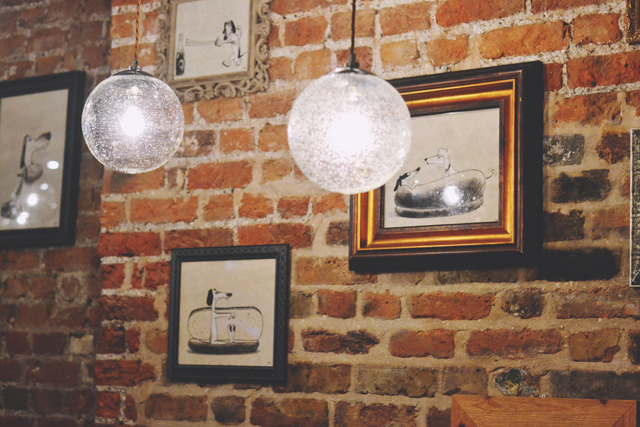 Some squishy armchairs wouldn't go amiss! Since neither of us are really fans of champagne (I know, I know. Kind of defeats the point of a champagne bar but I was drawn to it for the novelty), we both had a glass of apple juice with our hot dogs. 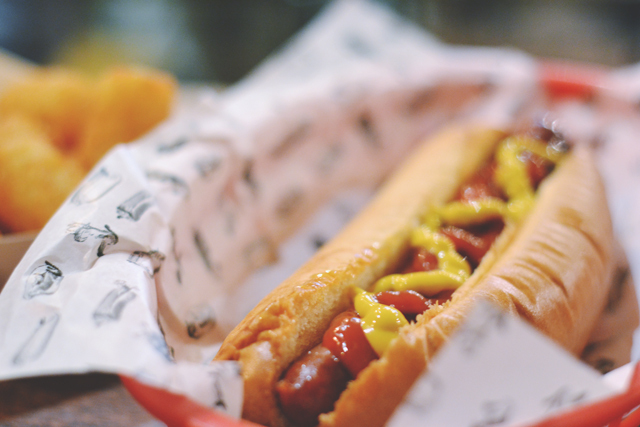 Although the menu boasts more hot dog dishes than you could ever imagine (mac and cheese hot dog, anyone? 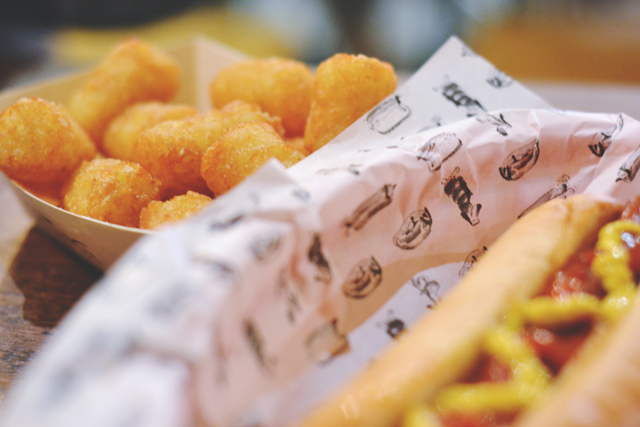 ), I settled on a plain old naked dog- aka your every day, common garden variety- with a side of tots. Our food came out super quickly and I was surprised by how thin the hot dog was. It tasted delicious though, and the tots were perfectly light and fluffy. Service was fast and efficient, almost to the point of being annoying. Let me finish my mouthful before you swoop in and take my bowl away! Having allowed an hour for lunch, this quick service meant we had a bit of spare time on our hands so we meandered back towards the Dominion and had a drink in the All Bar One next door. We found a seat next to the window which looked down onto the queue and kept an eye out. Around 2:30, I started to get worried that the doors would close before we made it, so we decided to join the line. Turns out I needn't have worried- the doors didn't open until half three anyway. As the doors opened, a security guard walked down the line telling us that all food would be confiscated but we managed to smuggle some drinks and crisps in just in case we got hungry! We were seated in stalls row Q, which had a fantastic view of the stage, just to the right of David's chair. Once the audience was settled, a man called Stuart came out to entertain us and explain what was going to happen. 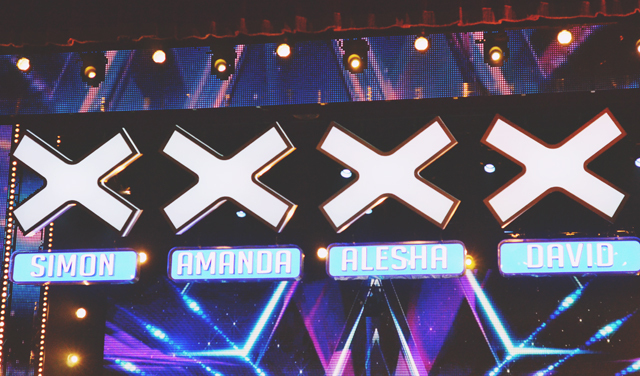 Although we were asked not to take any photos during the auditions themselves, he explained that we were allowed to take as many as we liked while the judges were seated. 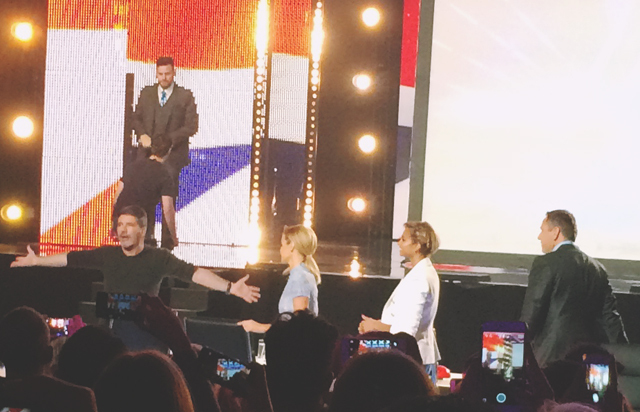 Then came the exciting bit: Ant and Dec came out on stage. Man, it was exciting! Although, to be honest, because they were framed by the stage, it did just look like we were watching them on a massive TV! 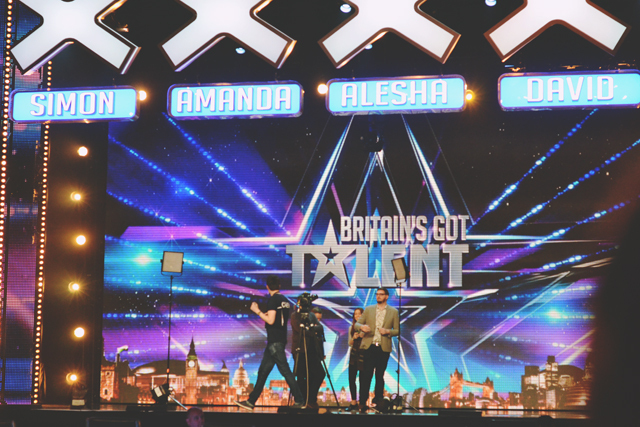 They filmed the "Welcome to Britain's Got Talent" intro sequence (apparently they were only filming it at this session but I'm not sure if that was a lie to get us excited) before getting some crowd shots of us jumping up and looking excited. When the producers were happy with the shots they'd got, the judges were introduced. I've always laughed at how Simon Cowell milks his walk down the aisle but good lord, in reality it took forever! He'd barely sat down before the first act walked out. 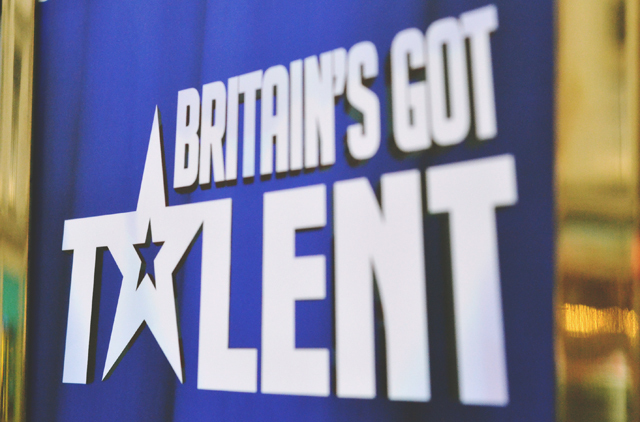 Over the next 3 hours, we watched around 15 acts audition, ranging from an elderly keyboard player and a magician who is Debbie McGee's nephew to a surprisingly powerful mother-daughter singing act and an Orthodox Jewish rapper. I think we may have got the short straw as none of the acts were either outstandingly good or incredibly bad. Of course the auditions are heavily edited to only show the most interesting acts but I do think we got a particularly middle-of-the-road session. I was also disappointed that we didn't get a glimpse of Stephen Mulhern, even when the judges were talking about him. Despite this, it was still a really entertaining day out. Stuart worked up a real party atmosphere between acts, and the Talent Cam was a particular highlight- while playing classic party tunes, the camera sweeps around the audience and focuses on a couple of people to show off their best moves. The most entertaining win a pair of tickets to the live final. Our winner was an incredible old man who had a balcony to himself and was proper rocking out. I'll definitely be applying for tickets next year. Even though the show was long, it seemed to be over in an instant and I really wanted to see some more acts. I've always said Amanda Holden has my dream job- sitting in pretty shoes and passing judgement on other people? Right up my street! After my experience at the auditions, I can safely say I would snap up her role without a second thought! Always wanted to watch one of these shows live! I think just seeing Ant and Dec in the flesh would be awesome haha! Crocs though... I've never owned a pair but I have tried some on and they are the comfiest shoes I've ever worn.